Following on from my last forensic based blog I thought I’d carry on the theme but this time have a look at carpets – well this particular carpet. So, what’s happened here? The carpet has a very dark soil laden walkway from the doorway diagonally across the room to a clean area in one corner. There are no impressions on the carpet in the clean area indicating that no furniture has been covering that area so why is it clean and the route to the carpet so dirty. Any ideas? Well, the discolouration on the wall behind the clean area may be a clue. The very heavy soiling in front of the clean area may help. The householder owns a very old dog that just manages to drag itself across the room to its bed in the corner. The marks to the wall and in front of the dog bed are again from the dog but the real culprit in the state of this carpet is not the dog its the owner. She is to blame because she ‘cleaned ‘ the carpet too often – sometimes every few days. So how come its in such a state you all ask in unison. Unfortunately she chose to ‘clean’ using a home carpet cleaner and detergent based cleaners. Each time she cleaned she only touched the surface whilst adding more and more sticky residue that attracted the dirt so that the carpet looked dirtier within only a couple of days. 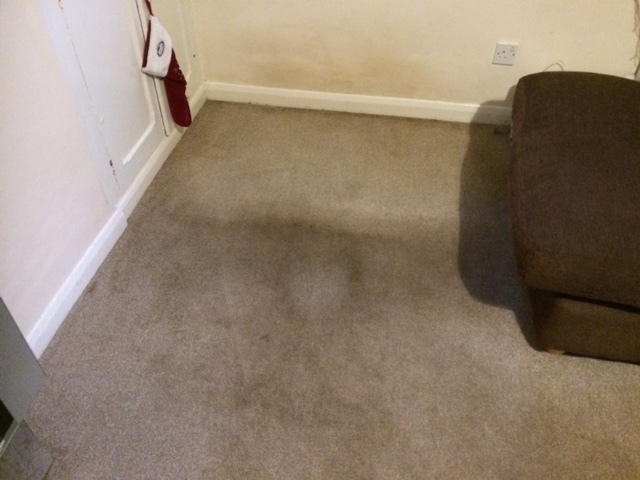 Fortunately The Rutland Cleaning Company were able to solve this Rutland carpet cleaning conundrum , clean the carpet and rid it of detergent residues so that it stays cleaner for longer.